CHICAGO (AP) — A wintry storm brought blizzard-like conditions to parts of the Midwest early Monday, grounding hundreds of flights and causing slick roads for commuters as they returned to work after the Thanksgiving weekend. The Chicago area was slammed with up to a foot of wet snow, and whiteout conditions stalled commuter traffic on the roads. The National Weather Service said 7.5 inches of snow fell at Chicago's O'Hare International Airport and 4.9 inches fell at Midway International Airport. 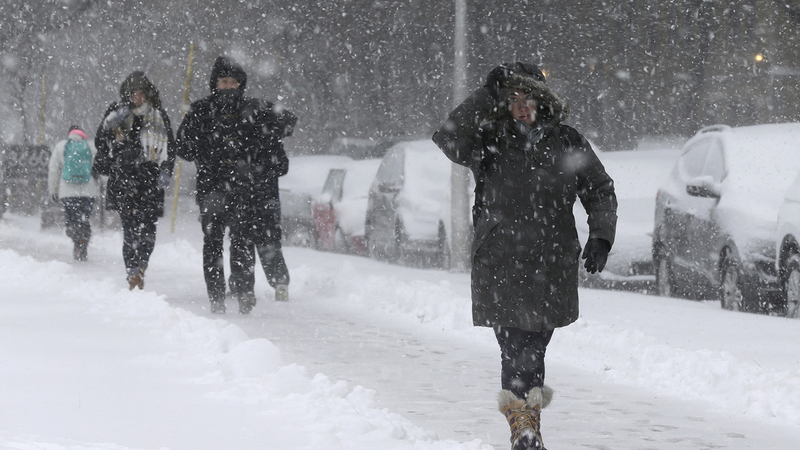 The 13.1 inches of snow that fell in McHenry County north of Chicago was the most in the region. The National Weather Service says 11.7 inches fell in Rockford — a total that shattered the record for a single day in November. The Chicago Department of Aviation says 809 flights were canceled at O'Hare between midnight and around 10 a.m. Monday, after 700 flights at the airport were canceled Sunday. At Midway International Airport, where 123 flights were canceled on Sunday, another another 71 had been canceled since midnight. Further south, Gov. Jeff Colyer declared a state of emergency in Kansas on Sunday after 2 to 14 inches of snow fell in parts of the state. The state Department of Transportation reported several road closures Monday, mostly in the extreme northeast, but said a stretch of Interstate 70 that had been closed on Sunday was reopened. Roads were slick in northern Indiana early Monday after about 2 inches of snow fell, and more was forecast through the afternoon. Parts of southeastern Wisconsin, just north of Chicago, suffered a glancing blow from the storm, with about 9 inches of blowing and drifting snow.